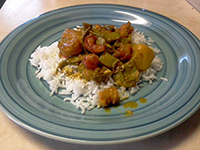 Curry shrimp is a great way of preparing shrimp. There are small, medium, large and extra large shrimp. They all make an excellent curry. Remove shells and devein shrimp. Then wash in cold water and set aside. Cut the tomatoes into 16 pieces and set aside. Add all other ingredients into a bowl (except oil), mix then add 1 cup water and mix again. Heat oil in a pan/pot, add mixture and stir for 3-5 minutes. Add water and continue stirring for another 4-5 minutes. Add tomatoes and shrimp and continue stirring for 3 minutes. Cover and remove from fire. Let this stand for 5 minutes.